What will it take for Singapore-listed companies to become globally leading brands? We all know Singapore is resource poor, unless you're talking about human resources. My vision, and the vision we pursue as a company, is to nurture every Singaporean to become a world-class presenter. Only that way will Singapore continue to have great brand ambassadors, for themselves, for their companies and for the country. Only that way will Singaporean innovators be able to attract global investments. Only that way can Singapore companies become global stars. Let's look at the facts. Singapore is currently home to just a handful of globally recognised MNCs. BrandFinance's 2017 league tables highlight the three banks, Wilmar, Singtel, and Singapore Airlines in the top 6. DBS comes out top with a brand value of US$5.4 bln. But globally, DBS ranks #303. Only Korea's Samsung (#6 with US$66.2 bln) and China's ICBC (#10 with US$ 47.8 bln) make it into the top of the league tables. We can't claim Singapore isn't large enough to build global brands. Sweden also only has six million people, yet Ikea, H&M, Nordea, Ericsson, Telia and Volvo are all in the top 500. Why? What really separates homegrown companies from global brands, including the MNCs that have their regional headquarters in Singapore? And I don't just mean having a communications department or appointing an investor relations officer. Nor do I mean putting a PR firm on retainer or spending money on a branding and marketing campaign. What we need is a culture of communication. Culture is "how we do things around here", and unfortunately what I see in many home-grown companies is that, around here, we communicate as little as possible. You see this in continuous disclosures to the Singapore Exchange, which has had to tighten the regulations again and again in order to get companies to communicate. Leverage your listing. You are already a public company. This clearly comes with responsibilities to make true and accurate disclosures to the market. But it also means you automatically have channels not open to private companies. Maximising these in a meaningful, relevant way provides you with an opportunity to build your brand. Have you explored all the options? It's about the recipient. A lot of effort is put into putting out messages. But it's all for naught if the message doesn't reach the intended audience, is misunderstood, not acted upon, or shared. Think about how your messages are received. The recent Asia Pacific Communication Monitor showed many communications professionals still see social media primarily as a broadcasting, rather than a listening tool. How are you engaging your audience? Develop a love for communications. Communications is the wrapper for everything that goes on in your business, never an after-thought. It is possible to enjoy communicating. Now, how will you get there? Achieving our vision of "Every Asian Business Leader a world-class presenter" is not just a social imperative, but also an economic, and ultimately an existential one. 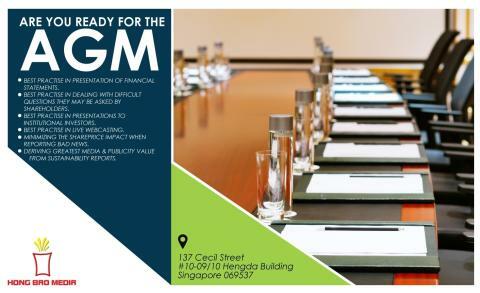 We are inviting Heads of Investor Relations and other communications and finance professionals to discuss this and other topics at our forthcoming workshop "Are you ready for the AGM?" With peak AGM season coming up, Hong Bao Media is teaming up with Paia Consulting to run a limited number of communications workshops for Heads of Investor Relations, Boards of Directors and Senior Leadership Teams.